How can I create market segments? There are multiple approaches to creating market segments, from simple “guesswork” to more scientific data-driven techniques. On this website you will find an article that addresses the two main market segmentation tools – namely segmentation trees and cluster analysis. But the purpose of this article is to explore the for/against of a broader selection of market segment approaches. Utilizing existing management understanding of the marketplace is a very acceptable way of generating market segments – provided a mix of experience managers are used, and provided that the team works towards a new/different segmentation approach (as opposed to their traditional segmentation structure). It may leverage marketing insights gained by the team over many years of experience. The management team is more likely to structure the segments on a fairly generic approach, which may lack insight or competitive uniqueness. This approach to market segmentation simply involves going through the standard list of segmentation bases, and just selecting one or more bases without any real justification. A common approach here would be to segment the market on an age basis, or on a geographic location basis, or even by light/heavy users. Please note there is nothing inherently wrong with this approach, and it is probably reasonably widely practiced in the marketing community. Certainly it is an easy, low-cost and fast approach, but can lack any underlying justification or connection to the actual market situation. Segmentation trees are discussed in another article on this website. The principle of a segmentation tree is to slowly break the market into sets of consumers by applying a different segmentation base one at a time. These can be constructed with or without consumer data. With the data, the sizes and buying potential of each market segment can be identified. Without the data, the various segments are essentially “guesswork” – however, the data may be applied at a later time to help validate the segmentation structure. A free Excel template to help you build segmentation trees and develop segment profiles is available for download on this site. The use of actual consumer data to form market segments is becoming more common, primarily due to the increased availability of the data. Many firms now have some form of customer database that is suitable for marketing analysis – and, likewise, many firms can now implement an online market research survey quickly and easily to capture relevant data. In fact, even marketing students undertaking assignments can also use online surveys to utilize some real data. 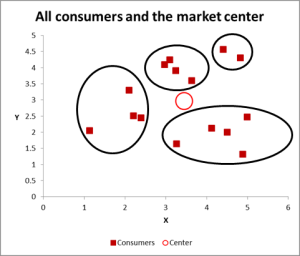 Cluster analysis is the statistical technique used to group consumer data points into related “clusters” – which we call market segments (essentially groups of related data points). Provides an output of segment measures for each market segment. Unfortunately, clustering relies upon access to consumer data – and the more valuable data for segmentation – psychographic and behavioral variables – may not always be available. Please note that I have a related website that discusses the concept of cluster analysis and provides a free Excel template to practice clustering. Please visit Cluster Analysis for Marketing for more information. If you have access to some relevant consumer data – you can plot the variables onto a scatter chart (two variables at a time) – and you should be able determine potential market segments on a visual basis. 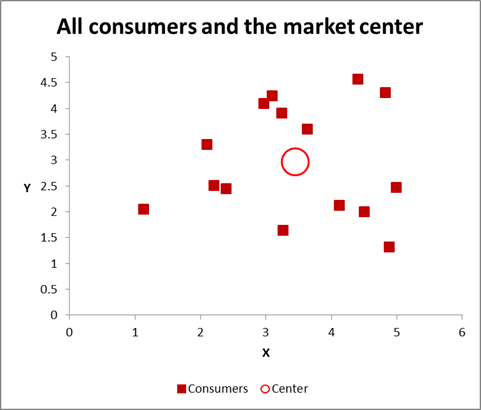 Take this scatter graph as an example – where two variables (labeled X and Y) are plotted for each consumer (the small red squares) and the average for all the consumers is shown as the larger red circle. 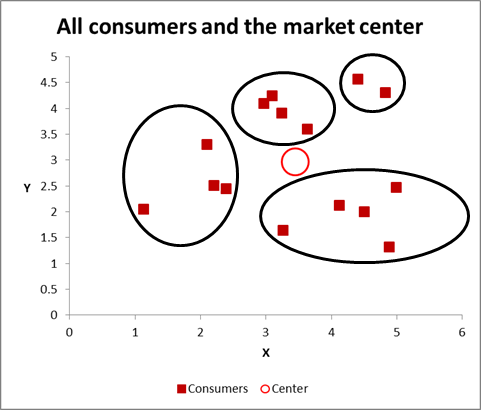 You might be able to distinguish clusters (sets) of consumers – these indicate potential market segments. Take a look at the next diagram where an attempt has been made to identify four market segments. The visual approach to market segmentation is a good approach if you only want to consider two variables. You can use Excel to create several of these charts using different variables fairly quickly. And because they are based on actual consumer data, you should be able to construct measures of each segment. The main disadvantage with this approach is that you are limited to two marketing variables only. Quite often aspects of a firm’s marketing strategy and its various promotional campaigns are “borrowed” from a competitor. No doubt you have seen similar TV commercials produced by different firms. Therefore, the same approach can be used for market segmentation purposes, particularly in a situation of competitive rivalry – where the competing firms look to attack/defend each other. It is also a good approach for a smaller firm that may not have the need to be overly sophisticated with their approach to segments – so mirroring the approach of the major players should work well for them. However, it leads to a “me-too” situation unless the marketing strategy is somewhat unique. Therefore, this approach is a poor choice for newer firms and those players seeking to be more innovative in their practice. The final approach to be considered is using the “standard” market segments that have been identified (and studied) by market research firms and other marketing and analytical consulting firms. An example of this – which is commonly found in marketing textbooks – is the Values and Lifestyle segmentation (VALS) approach. “VALS segments US adults into eight distinct types—or mindsets—using a specific set of psychological traits and key demographics that drive consumer behavior.” – Please see their website for more details. Obviously the downside of this approach is that many other firms use the same segmentation structure – so if you’re looking to a new way of thinking about the market, this is not for you.